Next ‘chapullers’ of the ‘Chapullers Tell the Story of Gezi’series are LGBT individuals… They have been one of the trending topics due to their Gezi slogans and their discourses. Two of those chapullers, Şehriban and Harun, told insanhaber.com how they have taken their place in Gezi. 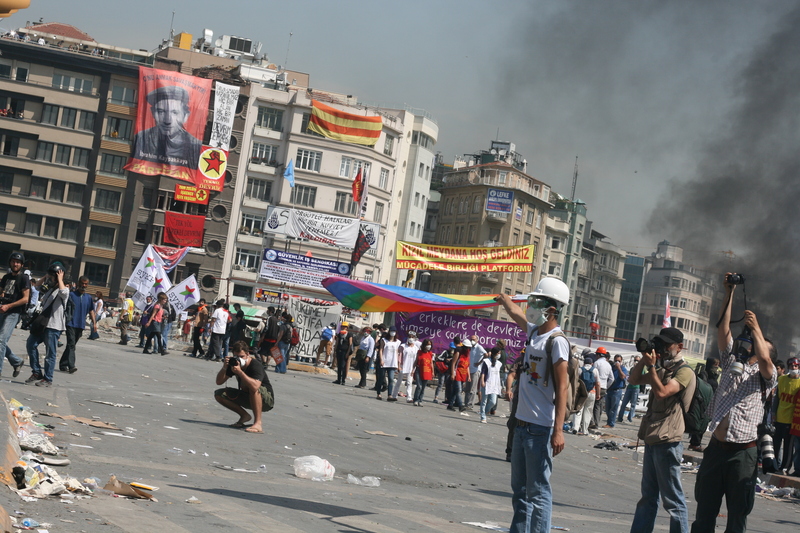 One of the groundbreaking elements of Gezi Resistance was LGBT individuals. They put their signature under a lot of protests thanks to their slogans, and their resistance at the barricades, including their book-reading protests in front of the police. We came together with Şehriban who became known with the protest of reading books in front of the police and Harun who has been at Gezi all along the resistance in Gezi Park… We talked about the theme of Gezi and empathy. - You were among the people who have been actively engaged in the Gezi protests… Do you think that Gezi Resistance has helped in overcoming the bias against LGBT people? Harun: Women, too, play a somewhat active role during wars. But when the war is over, there is always a return to social gender norms from a certain point on. Now, we may see it as if we have overcome the bias a little. Yet, we have to look at it from a perspective of one year. Will we go back to these gender norms when Gezi protests stop? If we are to go back, what will be the situation in terms of all the things that happened? Will LGBT people be remembered really? Or will we be subject to the same unjust treatments during our daily lives again? Which, recently a trans woman has been the victim of a hate killing in Kuşadası. Again, another trans woman has been subjected to police violence in Ankara. - What about you? Have you had such an experience? Harun: I haven’t experienced it in the socialization of Gezi but we are still subjected to that judgmental look, visual and verbal harassment. - Can we say that Gezi changed some things at least? Harun: Of course there are things that changed, and there are biases that this visibility helped to overcome. For example, we know that people from outside were reacting against us or laughing at us somehow during the marches we organized against hate killings before Gezi. However, we saw a lot more participation in this march. Our march has gained legitimacy. .
Şehriban: We have always been in a struggle for all our lives. When a heterosexual is born, he/she doesn’t have to struggle but we always had to. 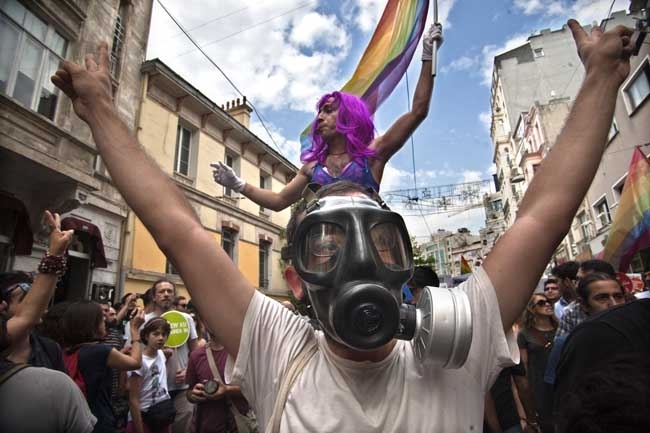 The things LGBT individuals experience such as not being accepted by their families or being murdered, the oppressive attitude of families etc… Gezi, on the other hand, benefited us suddenly with its activism, which we have been carrying on for years. We were ready, but still it astonished us! We may have stumbled sometimes but we came into contact in a very beautiful way. We stood side by side with groups which wouldn’t have come together at all. It was a very special feeling for us when we went down to Beşiktaş, heard the reactions of Beşiktaş fans and saw our flag flying on the barricades there. As Harun says, we are being subjected to violence and mocking looks. Even the people who have no idea learned the meaning of LGBT. We came into contact with them a lot. LGBT individuals were in the forefront at the barricades. - How would you explain the process that included you in the Gezi movement? Harun: It is related to LGBT having a history of 20 years. After all, LGBT has always been at close quarters and in contact with many leftist organizations. This enabled our more organized sortie in Gezi. Or maybe, we were able to carve out a niche for ourselves there. Harun: Gezi Park meant different things for everybody and from every perspective. 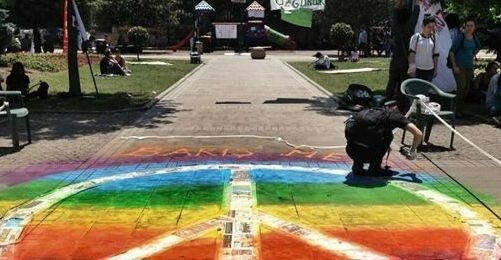 For example, it was also called “queer park.” This has become an issue that concerned us in the first degree as well. They are constantly trying to ostracize us. We know that they banished our friends by putting them on trains once upon a time; we know that Hose Süleyman (his nickname) was beating up with hoses; we know that they selected colorful sticks to beat us; we know how they put a trans into a sack with a cat and tortured her… We know all this. Therefore, the reasons for us being here from the beginning were not the trees or Gezi Park; we are here for Pınar Selek as well, we are here for Hrant Dink too; we are here for Emek Cinema, Haydarpaşa etc. One doesn’t need to be an animal to defend animal rights, and one doesn’t need to be LGBT to defend LGBT rights, either. 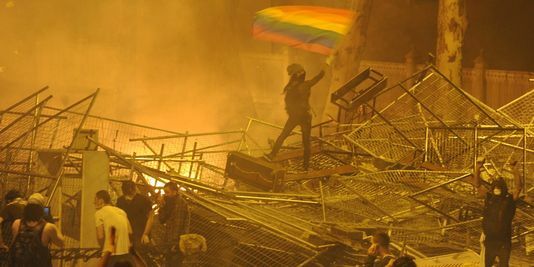 - We have clearly seen at Gezi that the approach to LGBT individuals was much more hospitable. Maybe Gezi was the best place for you as well in terms of expressing yourselves, what would you say? Harun: We are talking about a certain dictated dominant masculinity here; an industry which dictates and draws the lines of how a heterosexual individual’s performance should be as well; a system which is a consumption area. That is why heterosexuals as well are defending LGBT individuals since they are currently the victim of this system themselves. This is not only about Gezi Park, it is a part of urban transformation; and urban transformation aims at sterilization of city centers. And this is an effort towards standardization of the city centers where the majority lives against the individuals coming from outside. - So how did you interpret this side-by-sideness in Gezi and the government’s approach? Şehriban: Their concern was this when they first gave permit to Gezi: These people are going to go at it hammer and tongs anyway… Yet, we did not fight with each other. We have managed to sustain a communal life here; this was something the 80s generation was not able to do. Harun: They waited for us to fall out with each other since we are all coming from different fractions and representing different ideologies; yet, at the very point where the state withdrew all its mechanisms, we started to get rid of homophobia and sexism. So it means that we won’t be subjected to systematical violence in a place where the state isn’t present. Şehriban: We are a struggling group; we know how to get organized, how to protest, how to march and what kind of discourses to use very well. That is why our standing in Gezi protests has been a trending topic. We want people not to change their paths when they see a trans individual on the road; s/he is a human being, nobody would choose the night over the daytime to live in all their lives; so everything would change if only people managed to develop a little empathy. I have been with the groups of Halkevleri (Kemalist organizations) as well as anti-capitalist Muslims; we were always together. - So how were you received by leftist organizations? Harun: Certain leftist organizations supported LGBT individuals but they never socialized with any LGBT individual. I think this has an influence too. We’ve experienced these on 1 May as well. We were greeted enthusiastically when we entered the square. People started to overcome certain things gradually in time. Şehriban: I observed that women’s voices were dominant in “where are you my love” slogan while men’s voices were dominant in the majority of slogans. When they were shouting the “queer Tayyip” slogan, I said “we are here as queers but we can only say this when Tayyip comes out of the closet as a queer.” Then, people stopped and thought about this for example… This is why there isn’t such an obligation for the discourses to have strong sub-levels. We are saying “Although we are queers, get used to it, we are everywhere.” “The world would shake to its grounds if the queers were free…” Such discourses have startled the government as well, therefore they started to think “they got the queer now, what can we say to them in this case?” Çarşı (Beşiktaş fan club) shouted the slogan of “big shot queers are here” towards us, to make a gesture:) This was also very beautiful. Şehriban: Actually there is a provocative side of passive resistance here; I was actually disturbing policemen by reading a book to their face, and that was my intention too: to bother them. Harun: I am also someone who develops policies without violence. However, active resistance was also part of the resistance of course. This shouldn’t be ignored. Would passive resistance really be in sight if there wasn’t any active resistance? And I wasn’t bothered much of throwing stones at the police or throwing the tear gas they had thrown back at them. Tis is because sometimes passive resistance doesn’t work when the state attacks with all its might, all its weapons and technologies. Şehriban: And I want to add one more thing; we are very familiar with the “marginalization” policy of the state; they tried to implement the same thing at Gezi.. It is the same policy with the one that is being implemented on us: othering. Actually, this was something like the state’s exposing the individual and we already know that the state has been using this policy for years. Harun: This game was played on families firstly; they tried to send the kids away by claiming there were marginal groups there. We all experienced that confusion I guess. I think this is related to the fear mechanism the state has built on us since the day it was established. - Have you been in active resistance? Şehriban: I fought at the barricades but I am a little chicken hearted, a coward. I wasn’t at the very forefront but I had many experiences in which I calmed people down and aided people with talcid, and I took many people to other places many times. I told people what they should do during an intervention. However, there were people who were actively engaged in the struggle as well of course.